Flashback to 2010, 2011 and 2012, then fast forward to 2015 and tell me if you notice something very familiar on Undercover Boss? Maybe it's me, but if a new employee walks in with really bad hair and says he or she is auditioning for a reality show, or the chance to have his/her own store, something is up people. The other day I talked to the manager at Family Dollar and she was really pissed off that her company was going to be featured on the show. So pissed off, in fact, that she started cursing and saying if they ever showed up at her store, she'd sue! Uh...I'm not really sure if that would work, considering the owners can sort of pop into their stores whenever they want, but I wisely kept my mouth shut with that feedback. No way was I going to get yelled at! (lol) She then was irritated because she said the employees get no extra benefits and are not treated well, so if one of those people on the program got a trip or something, she was going to blow a gasket. Uh...okay. She finally ended the conversation by saying she wasn't going to even watch the "f***ing show. Done with her rant, she provided my receipt and wished me a good day. I couldn't make this stuff up guys, seriously. The BIG question of the day, however - Is This Real? Can everyone NOT know that something up? Do people still behave badly when they know they're on camera and simply not care? I'll still be watching because it's one of my guilty pleasures. 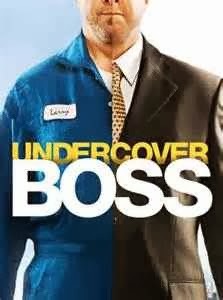 Personally, I love Undercover Boss because it gives a lot of insight into what goes on behind the scenes of companies like 7-11, Cinnabon, Hooters, Whitecastle, DHL, Retro Fitness, Rocket Fizz, Checkers, etc., and the lives of the employees. Of course, it really bugs my husband that I cry at the end of every show when people are given such awesome gifts, but I'm touched and really happy at how their lives are changed in such a positive way.